Liam Canavan has been challenged to nail down a starting place this season by Paul Holleran. 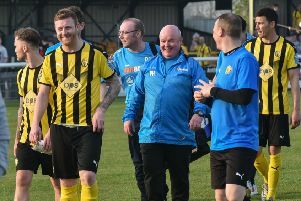 Leamington manager Paul Holleran says the gauntlet has been well and truly laid down to midfielder Liam Canavan following a underwhelming first campaign at the Phillips 66 Community Stadium. Canavan was one of three players re-engaged by Brakes this week alongside Ahmed Obeng and Kieran Dunbar and was by far the least expected having only played a peripheral role in the club’s first season back at Conference level . However, Holleran believes the penny might have finally dropped with the former Kettering Town midfielder after a season ravaged by injury, a lack of fitness and off-field problems. “With Liam, we were delighted to get him on board last year,” said Holleran. “Pre-season set the tone. He tore a quad in the first friendly and never got going after that. “In fits and spasms we saw what he was capable of doing and I’d be disappointed if I let him leave now. “He’s different to what we’ve got and in bits and pieces we saw what he’s all about. He can get past defenders and open up teams, he’s got great individual ability. “But last season he let Callum Gittings and Jack Edwards off the hook. “He’s used a couple of lives and the balls in his court to answer a few questions. “The gauntlet has been laid down and he’s got a summer programme. “More importantly, it’s about what he wants to do. “He’s had a look at this division now and believes he can play in it and do well. Meanwhile, Matty Dodd’s second spell with the club has ended, with Holleran confirming he will be looking for a club nearer to his Cannock home. “Matty will be looking to play his football a little closer to home next season,” said Holleran. “We always knew that would be the case as he only joined us until the end of the season but he played a huge part in helping us stay up and has always been a popular figure at the club.